New Years Dash Successfully Completed…. 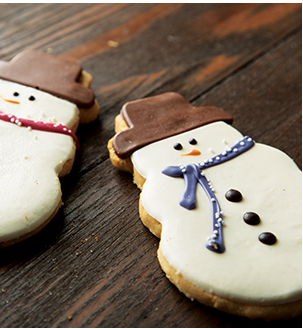 Starbucks ended the year with a really great promotion called ‘New Years Dash’. The offer was for up to an additional 20 Bonus Stars. 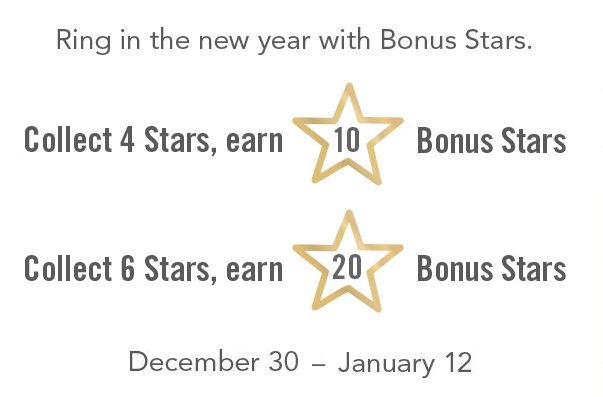 During the promotion period of December 30 to January 12 if you earned four Bonus Stars, you would earn an extra ten stars. If you were to earn six stars during this time, you would earn an extra twenty stars. 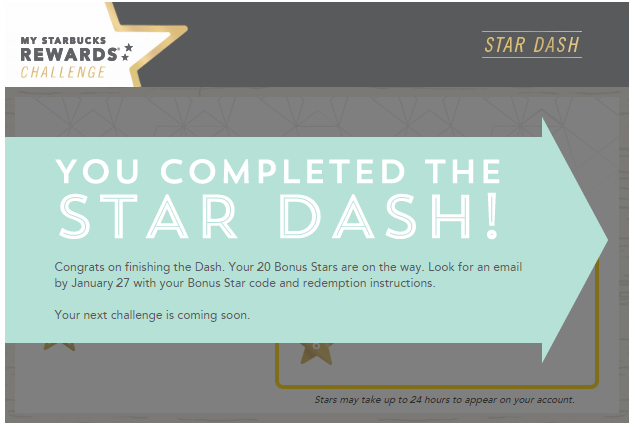 So, it looks like Starbucks is getting around to notifying those who completed the New Years Dash. 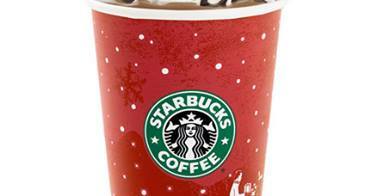 Those twenty Bonus Stars, combined with my coffee five, means two drinks compliments of Starbucks! And that is always something I’m grateful for! Did you catch the ‘Your Next Challenge is Coming Soon’? Maybe we can hope for a Springtime promo? How did you do? Have you heard about the status of your New Years Dash? Note: If you haven’t downloaded it yet, the app is available for the iPhone (in iTunes) and for Android (at Google Play). 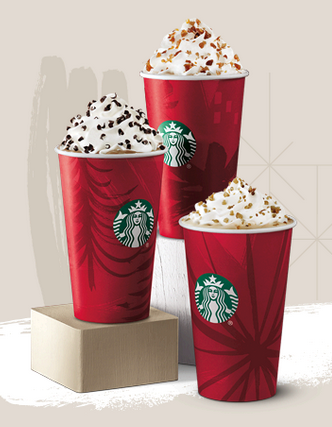 9 Comments on "Starbucks New Years Dash – Update"
I saw that tracking app at the beginning of the year on my Rewards account also. I usually track my rewards with my ipad mini. I think it’s cool. 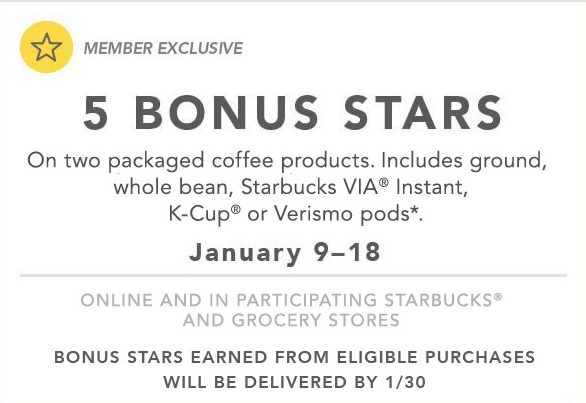 I also received the email for 5 bonus stars with 2 purchased coffees. With the BOGO sale on the Christmas coffee, I was able to complete both bonus star offers with only 3 purchases. Bought 2 CMAS 8 oz whole bean, got 3 stars, got 2 CMAS Vias, got 3 stars to complete the 6. Today, I bought two CMAS decaf 8 oz and got two stars for the price of only one. The supplies are limited of course, but I was able to find the coffees at 2 different less traveled Starbucks. I am fortunate enough to have access to a number of Starbucks here in El Paso. Wow! You did really well with the coffee! I received another offer dated for 1-13 to 1-19 for 2 bonus stars with any breakfast sandwich. 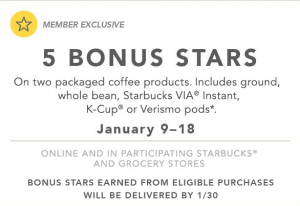 My mom recently signed up for a Starbucks account and she received an offer for 3 bonus stars with any espresso drink during the same time period. Interesting how they have different offers for different people. I received an offer for two Stars for purchasing a mocha. Hoping to pick that up today at the airport. Im still waiting for the email to redeem for the 20 bonus stars………have you received yours? 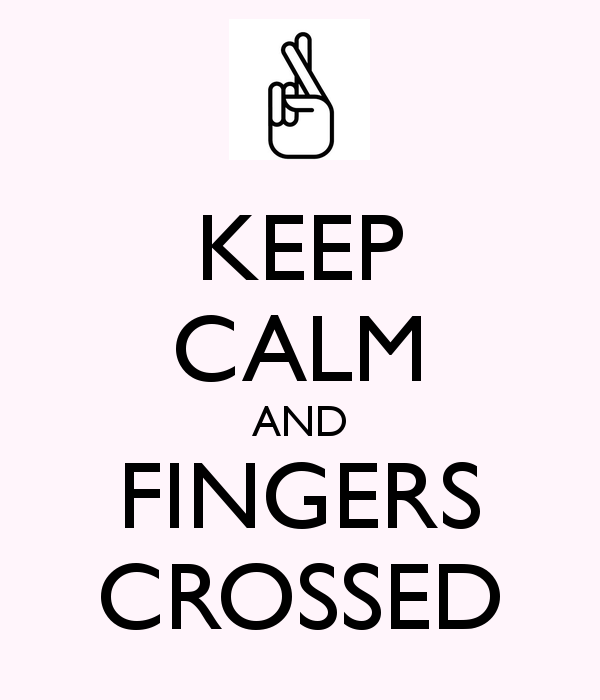 Not yet – but I’m not worried – it will come! Hooray! Mine hasn’t arrived yet … But I’m sure it won’t be long!